What's your opinion of the Bible's historical accuracy? 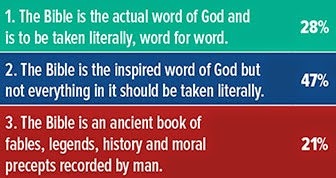 What people think about the Bible varies. Some would say that it contains accurate history. Others disagree and suggest that while it contains history, it shouldn't all be taken literally. And then some think nothing in the Bible is historically accurate. What is your opinion? Biblical Archaeology Review is running on an online poll you can participate in. Click here to cast your vote. Do take the poll, but perhaps leave a comment below whether you fit in category 1, 2, or 3. Over the weekend I saw a number of posts on Facebook which claimed that Christian children in Iraq are being beheaded by members of the Islamic State in Iraq and Syria (ISIS). I even saw one post claim that children were being buried alive. The potential evil and tragedy of the situation attracted my attention and made me wonder to what further level is humanity able to still sink. But I also know that in our digital age nothing spreads rumors and misinformation quicker than the internet and especially social media. So I scoured the various news sites. I performed Google searches and I looked for some acknowledgement of the tragedy when President Obama announced the US would be dropping aid to the Yazidis religious minority in Iraq. But I found no information about Christian children being beheaded. Consequently, I watched with the hope that it was not true. The situation in Iraq is terrible. But we should also be careful that we don’t do anything that might inflame it. All of the people of Iraq should be in our thoughts and prayers. But we can best help them by spreading truthful information about the situation rather than unsubstantiated reports. It’s easy to believe things about evil people, those we might consider to be our enemies. But we must also remember not to treat our enemies in such a way that make them out to be guilty of more evil than they already are. It becomes very hard to love and redeem one’s enemies when we are actively spreading misinformation about them that makes them look worse than they already are. I close with a quote from C.S. Lewis that was on the Gospel Coalition site. I think it applies to situations like this one.